No. Even though the same products can be traded, the series keys are different on the TOCOM Gateway. If a user tries to open an old workspace with TOCOM products on the new TOCOM Gateway, the contracts in the old workspace will not correctly resolve. Note that this also includes charts within X_STUDY. Before September 16th (pre-migration), make sure your workspace set as start-up does not include TOCOM products. If included, remove the start-up setting. After mock on September 18th or go-live on September 20th (post-migration), rebuild the workspace with TOCOM products with new series keys. Products will be displayed with the Last Trading Date or SQ date (fixed date for Gold Daily Futures) after migration instead of contract month. For X_TRADER user who is customizing Customer Defaults from X_TRADER, refer to “How Do I Migrate Customer Defaults?” and apply the necessary changes. Start the TOCOM Gateway prior to the first trading session in order to download settlement prices from the exchange. Have traders connected to the TOCOM Gateway resubmit their GTC, GTD, and GTDate orders for TOCOM products. For TOCOM Gateways connected to Strategy Engines, have traders resubmit their GTC, GTD, and GTDate spread orders to the Autospreader SE and synthetic orders to the Synthetic SE for TOCOM products. Will spreads in Autospreader that include TOCOM products have to be deleted in advance of the migration and rebuilt after migration? Any spread configurations that have products saved within it will need to be rebuilt. After the migration, customers will need to rebuild any Autospreader configurations with the new products. Tailor Made Combinations (TMC) are introduced for Gold Options. The ratio available is 1 due to an exchange limitation and can be combined up to 4 legs. TMC orders expire at the end of each session. GTC orders are not available for SCO (Standard Combination Order) spreads. SCO orders will be expired either at the end of session or at the end of the T session with GTD or GTDate. Do I need to migrate Customer Defaults? If Customer Defaults are customizable from X_TRADER, it needs to be updated after migration. Refer to "How do I migrate Customer Defaults"? Links that reference products on the TOCOM Gateway must be updated to map to the updated TOCOM product names where applicable. For more information regarding entering RTD formulas, refer to the XTAPI RTD Tutorial. The Instrument ID for a contract on the previously installed TOCOM Gateway. A second Instrument ID for the same TOCOM contract after it gets traded on the new TOCOM Gateway due to the series key change. Yes, the existing workspaces can be used. However, if users have an Alert Manager setting with TOCOM products, they may need to update it with the new products after migration. You can begin recording data from the new TOCOM Gateway following the migration. TOCOM positions will not be carried over to the new system. Users must manually enter SOD records for any outstanding TOCOM positions the morning of the go-live date, Tuesday, September 20. Note: Currently, the Risk Account for the TOCOM sub-account is in FFT3. This will be changed to the Account# after the upgrade, so the Risk Account has to be populated in the Account# field when publishing SODs and Manual Fills on the new TOCOM Gateway flavor (contact your local TAM for new flavors). Can traders use their existing trader IDs on the new TOCOM Gateway? For a TT-hosted environment, the TOCOM Gateway flavor will be changed for the TOCOM migration. Contact your local TAM for the new flavors. Advanced Prep - Create new flavors by copying from existing for the mock session on Sep 18th. On the day of mock trading - Enable new flavors and disable old flavors and do the mock trading. Update “Connection” in Customer Defaults if it is used. Disable old flavors and enable new flavors and do the mock trading session. Later (sometime after day session close on September 16th and before mock session on 18th) when you are preparing for mock session, disable the old Gateway flavors and enable the new flavors from User Admin > User’s Gateway Login Attributes > Filter on a flavor > Select All Rows > Edit. Filter on the old gateway flavors and disable: Uncheck Available to User, Available to FIX Client, and Automatically Login and Save. On the day of mock - Enable new flavors and disable old flavors and do the mock trading. Update “Connection” in Customer Defaults if it is used. How do I migrate Customer Defaults? Account# (up to 10 characters): The Sub-Account is no longer required in FFT3, and Risk Account (where Account Based Risk is imposed) is changed from FFT3 to Account#. How do I migrate product limits for Gateway Logins? The Migrate Users to New Gateways steps will migrate all Product Limits copied to the new flavor. For adding/editing Product Limits, refer to the Help library. How do I migrate Account Based Risk? As the exchange no longer requires the sub-account in FFT3, the Risk Account (where Account-Based Risk check is imposed) is now changed to the Account# field. Any risk limit configured with sub-account has to be configured with the value in Account#. All TOCOM products have new series keys, therefore you will have to migrate any Contract-Specific Overrides under Account Based Risk. From the User Admin window, select Contract Limits to check if contract limits have been set up for any products. Contract Limits change can only be updated after migration by editing each limit (mass edit is not available). Are there changes to Product Group Permissions? No, TOCOM has only one group named “TOCOM”. There is no change required for Product Group Permissions in TT User Setup. The following table lists changes in TOCOM Gateway behavior that may impact X_TRADER® API and TTAPI applications. Users should familiarize themselves with the following changes and determine the impact on existing X_TRADER API and TTAPI applications. What is the impact to TOCOM products? Series keys are updated for all TOCOM products. There are no dependencies that are version specific due to the upgrade to the new TOCOM platform. If a FIX client application is currently identifying instruments using the Security ID method (FIX tags 55, 48, and 207), and as a result of the change in values it plans to start using the Alternate Secuirty ID method, the application must include tag 167 in addition to tags 55, 10455, and 207. Administrators must determine how the new values will affect their FIX Clients and be prepared for those changes when products are migrated. The content value semantics for these FIX tags will change when connecting to the new TOCOM Gateway. Please refer to the following table. *Note: The new TOCOM Gateway will not no longer include the contract month in Tag 10455. You must update all FIX Adapter Client and Server Gateway Logins with correct logins as necessary. TOCOM is issuing all new sessions to customers for use on the Next J-GATE API, so new gateway logins are required. What is the impact to Timestamps? FIX Adapter configurations need to be adjusted to remove the -9 hrs bias that is currently in place for production TOCOM. TOCOM Gateways populate fill time and date using the data received from the timestamp_match field on the BD1. You can use the TOCOM schedule for the changed TOCOM series keys. How do I modify the FMDS.cfg file? Since the contract names are not changing, no modification to the FMDS.cfg file is necessary. How do I convert an existing FMDS database? Since the contract names are not changing, no database conversion is necessary. Open the FMDS Management Console window. On the Connection tab, in the Service Control section, click the blue stop buttons next to the TTFMDSFeed and the TTFMDSResp fields to shut down the FMDS feed and responder. On the Connection tab, in the Service Control section, click the blue start buttons next to the TTFMDSFeed and the TTFMDSResp fields to restart the FMDS feed and responder. If applicable, shutdown and restart any X_STUDY® applications running in your environment. TT recommends users upgrade to FMDS Version 7.6.1 or higher. Please refer to the TOCOM Gateway Order Server configuration topic in the help library. Price Server: The ITCH API is used to deliver streaming, real time price data. Price Bridge: The OM API requires a Market Information ID, similar to previous versions of the TOCOM Gateway, which is used to deliver certain reference prices such as Settlement and Open/Close. The secondary TOCOM Gateway and Price Server must be the same version and configured with the same Exchange-Flavor and multicast channels as the primary TOCOM Gateway. Any changes made in the aconfig.xml and aconfig_local.mxl files (e.g., enabling PFX) need to be made on both TOCOM Gateways. The same settings for the [PriceServer] section parameters. Identical product subscriptions. For example, if the primary Gateway is subscribing to MulticastGroup=TOCOM-1, the secondary Gateway must be subscribed to that as well. To configure the secondary TOCOM Gateway so that only the Price Server runs, comment out the Order Server and Fill Server sections in the ttchron.ini file on the secondary TOCOM Gateway. Identical MulticastGroups.cfg files are required on both the primary and secondary TOCOM Gateways. In order to support hot failover of the Price Server, each should have a Price Bridge configured with a unique Market Information ID in the hostinfo.cfg. Configure the Price Bridge on the secondary Price Server using the same Market Information ID as the primary Price Server, but comment out the Price Bridge section in TTChron on the secondary server. In this case, should failover to the secondary Price Server occur, Settlements, Open/Close and Price Limit prices will be missing on the secondary. When this occurs, the customer may perform a manual failover of the Price Bridge by enabling it in in TTChron after disabling it on the primary. How do I migrate an existing TOCOM Gateway to a new TOCOM Gateway on the same machine? Cancel all working orders including GTC, GTD, and GTDate orders. Stop all TT services running on the TOCOM Gateway. Uninstall all gateway child components: TTChron, TT Guardian, TT Messaging. Refer to the TOCOM Gateway Help to complete the installation and initial configuration of the TOCOM Gateway. Can I use Auto-SOD with the TOCOM Gateway? 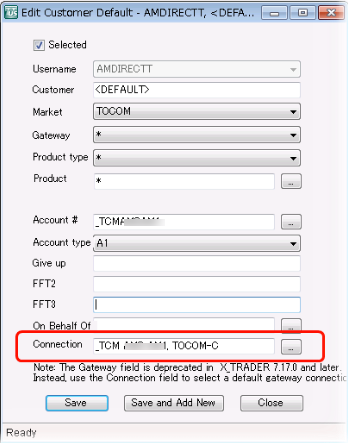 If Auto-Calculate-SOD was enabled on the existing TOCOM Gateway, ensure that it is enabled on new TOCOM Gateway after installation. If the Algo Definitions deployed before the migration contain any static Instrument Blocks pointing to affected instruments (i.e., TOCOM instruments with product names or series keys): users must update the templates with valid instruments and re-deploy. This means that any linked Algo Templates will need to be re-built. If the Algo Definitions deployed before the migration had user-defined Instrument Blocks: Any linked Algo Templates that were using affected Instruments will need to be updated. The information above applies to all affected algo templates. What is the impact to Strategy Engines (SEs) connected to the new TOCOM Gateway? Autospreader® SE, Algo SE, and Synthetic SE servers connected to TOCOM Gateways in your trading environment are impacted. No configuration changes for Synthetic SE will be needed, unless the gateway flavor will be changed as a result of the migration. What about working orders on SEs for TOCOM contracts? The series keys for TOCOM futures, options, and exchange-defined spread products will change after the upgrade to Next J-GATE. In the near future, TT will provide a “TOCOM Product Series” table in this Guide for a list of all futures, options, and spread products series key changes.